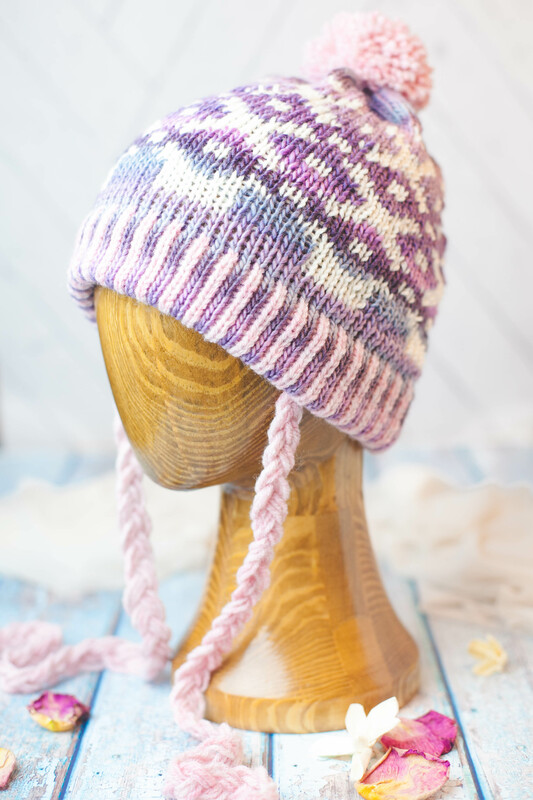 This beautiful toque features lovely, painterly colorwork and a hemmed brim for extra warmth. The optional braids add a touch of fun! Intermediate level pattern. Loom: KB All-n-One Loom, using 72 or 84 pegs. 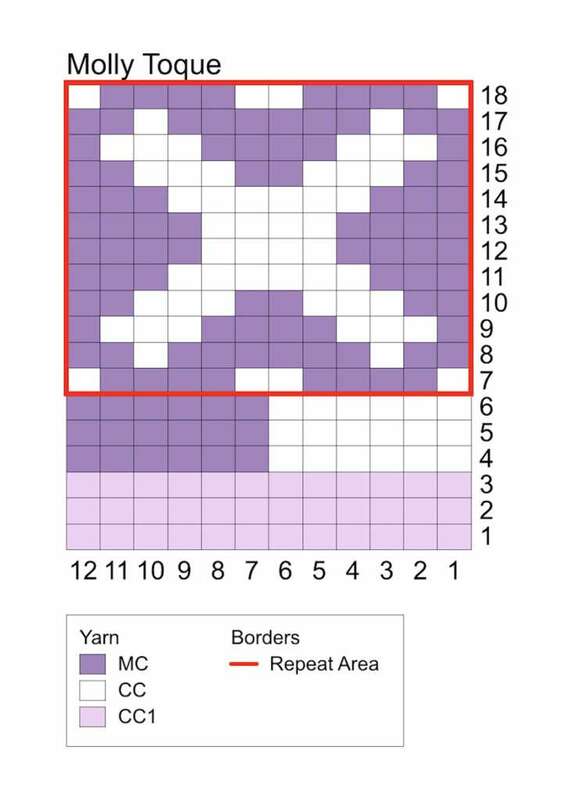 Color pattern works in multiples of 12 stitches. Yarn: (MC) Knit picks Chroma Worsted, #4 weight, 70% superwash wool, 30% nylon, 198/100 g, 1 skein, color # 26552, Avalon. (CC) Lion Brand Wool-Ease, worsted #4 weight, 80% Acrylic, 20% wool, 197 yds/180 m, 3 oz, 1 skein, color #104, Blush Heather. (CC1) Cascade Yarns 220 superwash, 100% Superwash Wool, worsted #4 weight, 100 g/3.5 oz, 220 yds/200 m, 1 skein, color #817, Aran. Finished Measurements: 19”/48.3 cm around x 8 ½”/21.6 cm high or 22”/55.9 cm around x 8 ½”/21.6 cm, sizes are approximate. 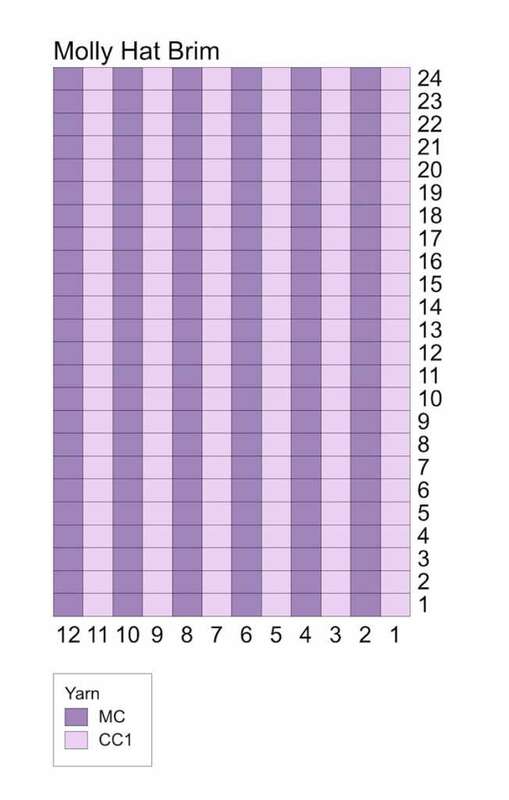 Gauge: 16 sts and 26 rows = 4”/10.2 cm square in stockinette. Please take the time to check gauge for proper width. 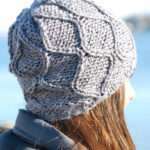 The hat is knit in the round from the bottom up. A hem is formed after row 24 to form a double thick hat brim for extra warmth around the ears. 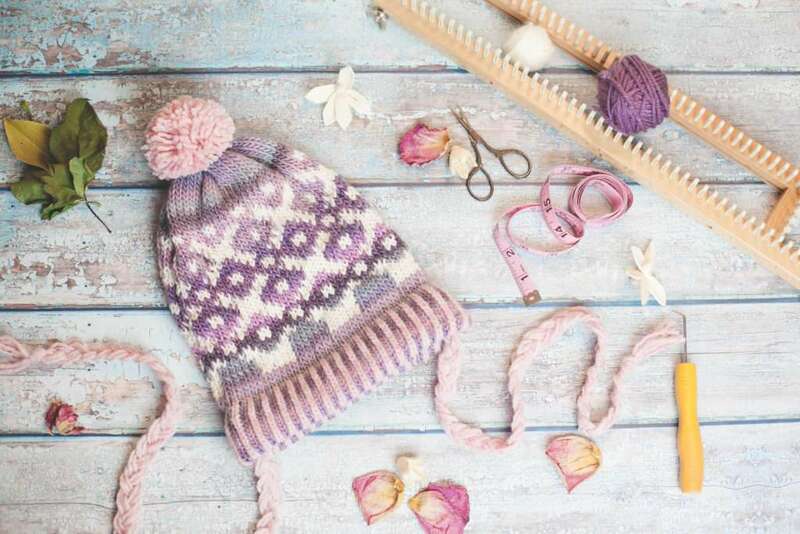 The regular knit stitch is recommended for all colorwork areas of this hat. Carry your floats for a neat appearance inside of hat and neater stitches. Use 72 pegs for large child/sm teen or adult. Use 84 pegs adult/teen sizes. It’s best to do a gauge swatch to check for size. Stranded knitting has less stretch and can produce a smaller hat than regular stockinette. 2 charts are included, one for the brim and one for the main portion of the hat. Foundation round: Chain CO (72) (84) pegs with 1 strand MC; join to work in the round. Rounds 1-24: *[K1 in CC1, k1 in MC] repeat from * to end of rnd. Your total knitting should be 4”/10.2 cm. Add more rows if short. This will give you a 2”/5.1 cm brim once hemmed. Form hem: Lift all stitches from the cast on row up onto the loom, one by one, being careful to keep your stitches straight. Do not pull the bottom stitches over the top stitches, knit them together in the next round. Rounds 1-3: *K12 in CC1, rep from * to end of rnd. Rounds 4-6: *K6 in CC, k6 in MC, rep from * to end of rnd. Round 7: *[K1 in CC, k4 in MC, k1 in CC], rep from * to end of rnd. Round 8: *K2 in MC, k1 in CC, k6 in MC, k1 in CC, k2 in MC, rep from * to end of rnd. Round 9: *K1 in MC, k3 in CC, k4 in MC, k3 in CC, k1 in MC, rep from * to end of rnd. Round 10: *K2 in MC, [k3 in CC, k2 in MC] twice, rep from * to end of rnd. Round 11: *K3 in MC, k6 in CC, k3 in MC, rep from * to end of rnd. Rounds 12-13: *K4 in MC, k4 in CC, k4 in MC, rep from * to end of rnd. Round 14: *K3 in MC, k6 in CC, k3 in MC, rep from * to end of rnd. Round 15: *K2 in MC, [k3 in CC, k2 in MC] twice, rep from * to end of rnd. Round 16: *K1 in MC, k3 in CC, k4 in MC, k3 in CC, k1 in MC, rep from * to end of rnd. Round 17: *K2 in MC, k1 in CC, k6 in MC, k1 in CC, k2 in MC, rep from * to end of rnd. Round 18: *[K1 in CC, k4 in MC, k1 in CC] twice, rep from * to end of rnd. Repeat rounds 7-18 until hat measures 7”/17.8 cm. Note: You may adjust this length if you would like a longer slouchier hat. Leave 1 ½”/3.8 cm for the top portion of the hat. Next round: Knit in MC. Repeat the last round until total work measures 8 ½”/21.6 cm or desired length. Bind off hat using the gather method. FINISHING Weave in ends and block hat to even out stitches. 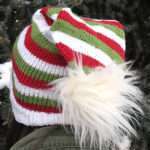 Make a medium size pom-pom using CC and secure it to the top of the hat. Follow directions for braids below. Cut 9 strands of CC, each measuring 40”/101.6 cm. Align all strands and knot one end close to ends (this is the top of your braid). Separate strands into 3 sections of 3 strands and braid to end. Knot end, leaving 2”/5.1 cm. Go to the top of your braid and using a yarn/tapestry needle threaded with a strand of CC, sew the strands together just below the knot. Make sure braid is flattened out to keep seam flat. Sew braid to one side of the hat, inside of hat (about 1 ½”/3.8 cm from edge) hiding the seam. Repeat above for 2nd braid. Beautiful hat! Thank you for the pattern. 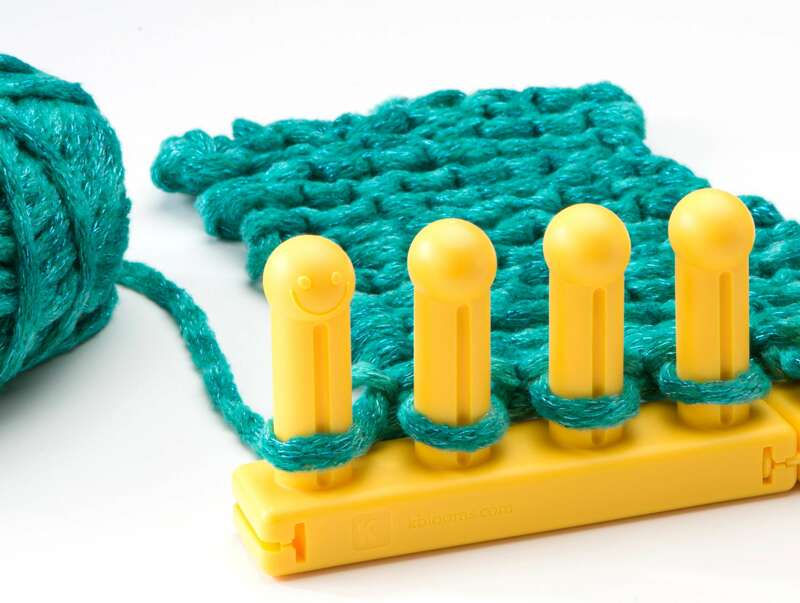 When you refer to the “regular knit stitch” do you mean true knit stitch (the one that you do like a purl but pull yarn from above the loop on the peg) and not e-wrap knit stitch? So beautiful ! I love the colors . Hello Christine, yes the “true” knit and “regular” knit stitch are the same thing. The e-wrap knit will be written as ewk in my patterns unless otherwise stated in the key. In foundation round, it says CO. What is that? Thanks in advance. Hello Cindy, CO is the abbreviation for cast on. Hope this helps!